The Republican Party’s struggles in appealing to young people have been well documented. And even those Millennials who do identify as Republicans or lean toward the GOP are decidedly less conservative than older Republicans. Overall, Millennials (currently ages 18-33) are the most liberal age group. In our report on Political Polarization in the American Public, we used a scale based on 10 political values questions about the role of government, the environment, homosexuality and other issues to measure ideological consistency. This survey of more than 10,000 Americans finds that, on this scale, Millennials are considerably more liberal than other generations: About four-in-ten Millennials are mostly (28%) or consistently (13%) liberal in their views, compared with 15% who are mostly (12%) or consistently (3%) conservative (44% are ideologically mixed). Older generations are progressively more conservative. The relative liberalism of Millennials translates into a greater likelihood of affiliating with or leaning toward the Democratic Party compared with those in older generations. Today, about half of Millennials (50%) are Democrats or lean to the Democratic Party, while just 34% affiliate with or lean to the GOP. By comparison, Baby Boomers (those ages 50 to 68) lean slightly Democratic (46% Democratic/Democratic leaning, 42% Republican/Republican leaning), while those in the Silent generation (ages 69 to 86) are about evenly divided (47% Republican/Republican leaning, 44% Democratic/Democratic leaning). But in addition to the generation’s Democratic tendency, Millennials who identify with the GOP are also less conservative than Republicans in other generations: Among the roughly one-third of Millennials who affiliate with or lean Republican, just 31% have a mix of political values that are right-of-center, while about half (51%) take a mix of liberal and conservative positions and 18% have consistently or mostly liberal views. Among all Republicans and Republican leaners, 53% have conservative views; in the two oldest generations, Silents and Boomers, about two-thirds are consistently or mostly conservative. In short, not only are Millennials less likely than older generations to identify as Republicans, but even those who do express significantly less conservative values than do their elders. 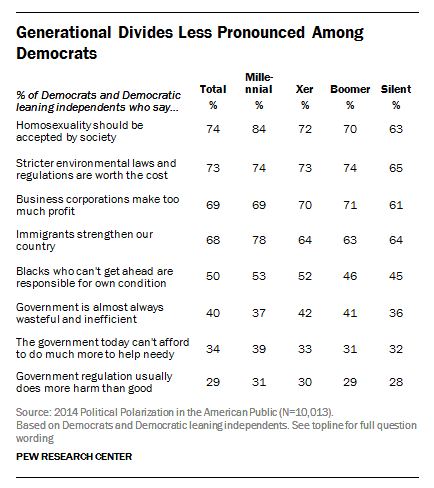 No such generational divide exists among Democrats. Across all generations, majorities have values that are left-of center, while most others have a mix of liberal and conservative values. 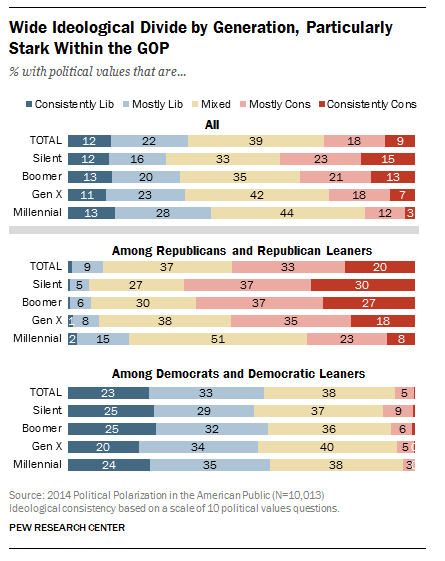 The generational divisions among Republicans span different dimensions of political values. Some of the most striking generational differences within Republicans concern social issues like homosexuality and immigration, but younger Republicans are also less conservative when it comes to values related to the environment, role of government, the social safety net and the marketplace. By a 64% to 30% margin Millennial Republicans say that homosexuality should be accepted by society rather than discouraged. Among older generations of Republicans, no more than about half think homosexuality should be accepted. There is a similar generational split in the GOP over immigration: On balance, younger Republicans say immigrants strengthen our country with their hard work and talents, while older Republicans say immigrants are a burden on our country by taking our jobs, housing and health care. The generational divide in the GOP carries over to views of business and regulation as well. While Boomer and Silent Generation Republicans overwhelmingly see stricter environmental regulations as hurting the economy, Millennial Republicans are divided almost evenly over whether this is the case or whether they are worth the costs. Similarly, older generations of Republicans believe business corporations make a fair and reasonable amount of profit these days, while half of Millennial Republicans think they make too much profit. And younger Republicans are far less skeptical about government than are older Republicans. About six-in-ten (59%) Millennial Republicans think that “government is almost always wasteful and inefficient,” compared with roughly eight-in-ten of Republicans over age 33. 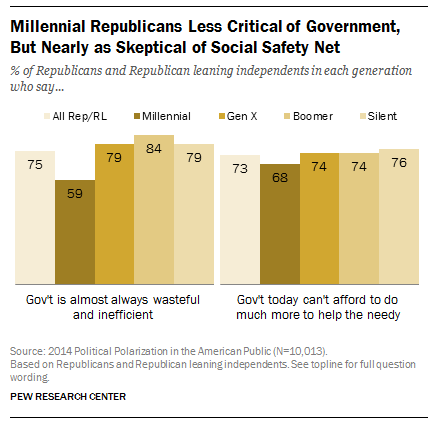 But there is little difference across generations within the GOP over social safety net programs: About three-quarters of those in older generations say the government can’t afford to do much more to help the needy, compared with 68% of Millennial Republicans. And while Millennial Republicans have more liberal views than older Republicans on a number of issue dimensions, they nonetheless are more conservative than Democrats across age groups. For instance, Millennial Republicans are 19 points more likely than all Democrats and Democratic leaners to say that government is wasteful and inefficient (59% vs. 40%) and are 19 points less likely to think that business corporations make too much profit (69% of Democrats vs. 50% of Millennial Republicans). Although younger and older Democrats don’t agree on everything, their general profile and priorities are far more in alignment than is the case within the GOP. The age differences among Democrats are generally a matter of degree, not direction. Millennial Democrats are 21 points more likely than Silent Generation Democrats to say homosexuality should be accepted by society (84% vs. 63%). And they are also more positive toward immigrants. There are other realms where younger Democrats are, if anything, more conservative than their elders. Millennial Democrats are slightly more likely than older Democrats to say government today can’t afford to do much more to help the poor and needy in this country or that blacks who can’t get ahead are responsible for their own condition, for example; but these differences are very modest.